August 1, 1991 PRESS PREVIEW: Thursday, September 19, 1991, 6:00-9:00 p.m. Special motorcoach service will be available to the Museum from Manhattan, departing from the Central Park side of the Plaza Hotel at 5:30 p.m. and from the southeast corner of West Broadway and Houston at 6:00 p.m. Reservations are required. Please RSVP to Sally Williams or Michelle Menendez in the Public Information office, (718) 638-5000, ext. 330/331. French-born sculptor Alain Kirili will install the fifteenth work in his Commandment series in the Grand Lobby of The Brooklyn Museum. He began the series in 1979, the year following his move to New York from Paris. The Brooklyn Museum project consists of over forty forged iron elements that are placed on a large platform to create a more than thirty-foot-long field of sculpture. 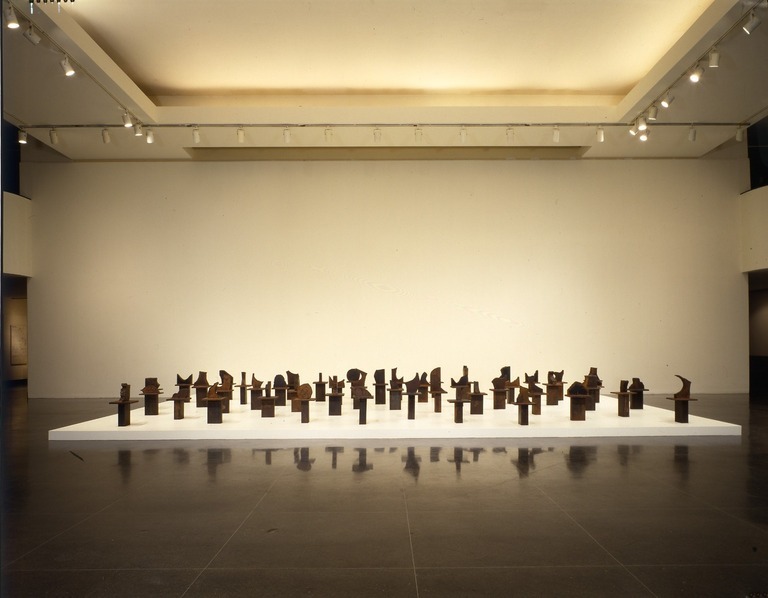 Commandment is the twenty-eighth project in the Grand Lobby series and will be on view from September 20, 1991, to January 5, 1992. Kirili creates his sculpture at a Trenton, NJ, iron forge, a process he learned from American and Austrian craftsmen. Iron forging is extremely time intensive and fatiguing, allowing him to work for only two to three hours at a time. 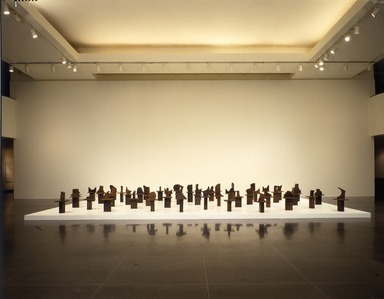 Using no sketches or maquettes and having no advance plan, Kirili casts each of the elements in the Commandment series intuitively, relying on his comprehensive knowledge of Western and Eastern art and his fascination with scriptural, monotheistic, and traditional religious concepts. Alain Kirili was born in Paris in 1946 and received little formal training as an artist. 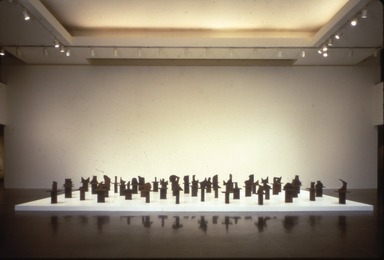 In 1979 he moved to New York and began the Commandment series, drawing on a variety of sources to inform his work, including Western and Eastern art history and religion. In conjunction with the installation, the Education Division will present an Artist-in-Residence program, consisting of a studio visit for adults on September 28 and a studio visit for teenagers on October 19. At his studio Kirili will explain his sculptural processes, drawing attention to the methods and materials used in Commandment and his other works. The project was organized by Brooke Kamin Rapaport, Assistant Curator of Contemporary Art, with the assistance of Laura Deer Moore, a curatorial intern funded by the Lila Wallace-Reader’s Digest Fund. The exhibition and its associated Artist-in-Residence program are made possible by the Lila Wallace-Reader’s Digest Fund. Brooklyn Museum Archives. Records of the Department of Public Information. 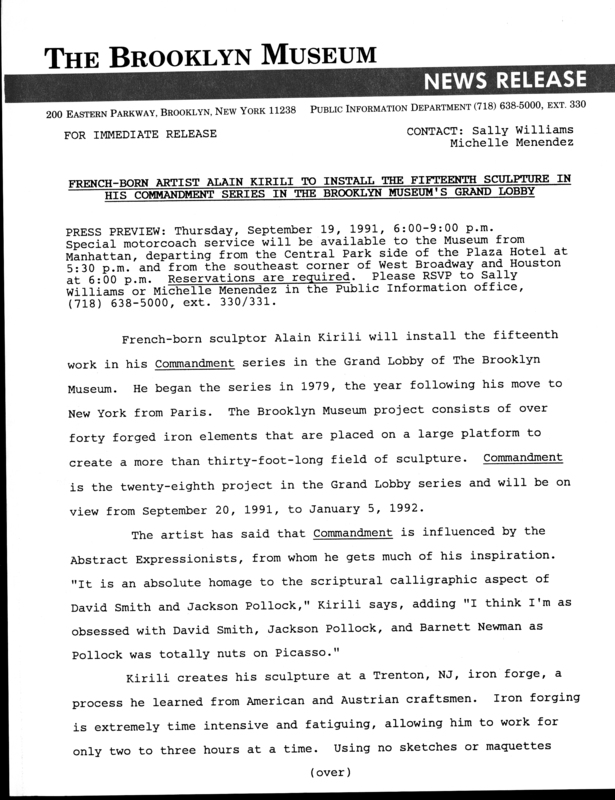 Press releases, 1989 - 1994. 07-12/1991, 166-167.